While the conventional cancer constituents would have you think “early detection” is the best weapon against breast cancer, it seems far more rational to suggest that prevention is an even more powerful weapon. After all, preventing breast cancer means no detection is needed, no annual x-rays and no need for Big Pharma-created drugs. There are many ways to prevent breast cancer, with one recent meta-analysis highlighting the importance of one particular food in breast cancer prevention— flaxseeds. Flaxseed has many powerful anti-cancer properties and many that are specific to women, hormones, and the prevention of breast cancer. The new meta-analysis was published in a recent issue of Integrative Cancer Therapy, and investigated more than 1,800 records from various academic sources all relating to breast cancer and the effects of flax. 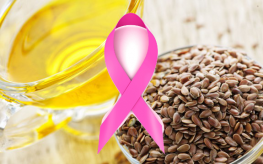 Among women who were recently diagnosed with breast cancer, flax was shown to increase selective cell death within the cancerous tumors, decrease the expression of a protein associated with breast cancer malignancy (HER2), decrease proliferation, and decreases in hot flashes. Perhaps most significant, the consumption of flax was associated with an 18% reduced risk of primary breast cancer. It was also associated with a lowered death rate among breast cancer patients by 32%. Harnessing phytoestrogenic properties and hormone changing effects, flax is often used as a solution for menopausal symptoms. But it’s these same effects that can potentially change breast cancer outcomes in women. Unfortunately, the cancer machines (American Cancer Society, Susan G. Komen, etc.) designed to encourage cancer reactivity rather than proactivity aren’t talking about it. Instead, they’d like to discuss why we need to “raise awareness” about breast cancer and get regular screenings. The answer to breast cancer, as in all other forms of disease, is largely found in our dietary choices. There are anti-cancer foods whose beneficial properties we are just beginning to understand, and there are cancer-fueling foods that are dumped by the truckload into American supermarkets. Our choice, as health conscious consumers, should be clear.